The Washington Nationals play only 15 games this season in the First Division, so they need to make all of them count. Last week, they opened with a three-game sweep on the road against the San Francisco Giants. Next week, they're in Los Angeles to face the Dodgers, who are in the relegation zone. Ryan Zimmerman led the way offensively for the Washington Nationals this week against the San Francisco Giants (Keith Allison/Creative Commons Attribution-Share Alike 2.0 Generic license). In eight years of playing out the promotion/relegation scheme across baseball, it's never been the case that any team played every other team in its division. By contrast, every team plays every other team every year in basketball, hockey and soccer. Unlike the other sports in which we operate ordinal divisions with promotion and relegation (soccer style, one might say) baseball draws up huge scheduling imbalances that require us to draw up special rules. The results lead to questions in baseball about what kind of performance should count as good enough to win a division or be promoted, and what should count as a poor enough performance to guarantee relegation. From the start, it has been stipulated that any team that wins a division or is promoted in the three eight-team divisions (First, Second and Third) must have played against at least three other teams in the division and must have won at least 10 games. 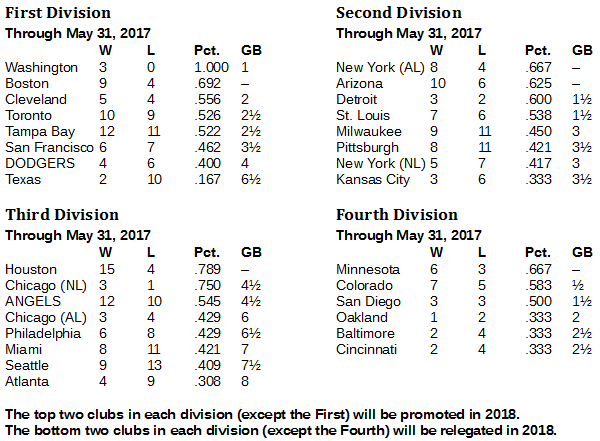 For a team to be demoted from these divisions, a team must have played at least three of the other teams and lost at least 10 games. It also was established that two teams will be promoted from each of these divisions (except the First) and two will be demoted from these divisions every year. 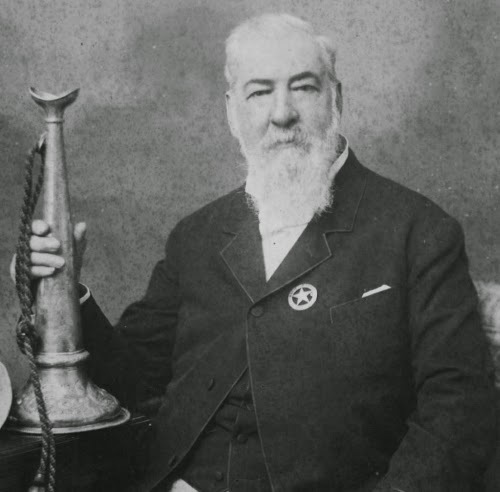 The rules were introduced to keep light schedules from unduly influencing promotion and relegation. They have worked well. There are a couple of other rules, which don't need to be addressed here. And the Fourth Division, which has only six teams, involves other rules still. This comes up because the Washington Nationals are on the docket for only 15 games in the First Division this year. It is the lightest schedule any team has ever had in the First, Second or Third Divisions. The schedule is light for the Nationals because there are only three National League teams in the First Division (the others are the Dodgers and the San Francisco Giants). Further, the Nationals have only one interleague opponent in the First Division, which is the Texas Rangers. It all means that the Nationals must win 10 of their 15 games to even be eligible for the First Division championship, if they don't make the playoffs. The trade-off is that the Nats can't be demoted without losing at least 10 games. Keep in mind, though, that the playoffs also count in the baseball ordinals. That's one of the special rules. Last season, they were decisive. One can see now why the moment is of some importance, for the Nationals finally played in the First Division this week, sweeping three in San Francisco against the Giants. In the next 10 days, the Nats will play six more First Division games. They will play three in Los Angeles against the Dodgers June 5-7 and three at home against the Rangers June 9-11. By sweeping the Giants in a series made infamous by the Memorial Day brawl centered on Bryce Harper and Hunter Strickland, the Nationals have made all of those games crucial to the First Division race. Harper drew the headlines after retaliating against Strickland, who threw at the National star's hip in their first meeting since Harper hit two home runs off him in the 2014 playoffs. 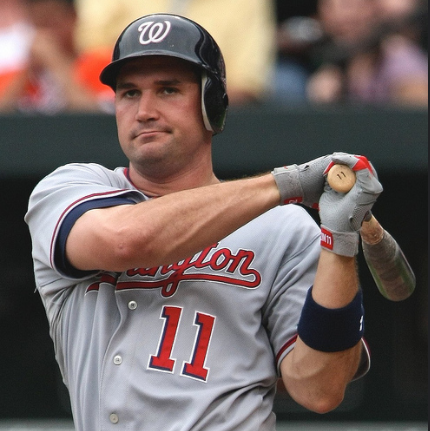 But the star for the Nationals was Ryan Zimmerman, who went five-for-12 (.417) with two homers and five RBI in the three games. Looking here at the standings, one sees the Nationals listed on top at 3-0 with a 1.000 winning percentage, ahead of the Red Sox at 9-4 and .692, even though the Red Sox are a game ahead of the Nationals. Again, we note the imbalance. Most often, the percentage column and the games behind column will match, but not always. If one team wins the percentage column and a different team wins the games column, we declare a split championship. Fair enough. There is more to note in the First Division standings. Down there on the very bottom are the Texas Rangers, already 2-10. The Rangers appear doomed for demotion. But they have 17 games left in the First Division, so there's still time for them to dig their way out of relegation. For that to happen, though, the Rangers will need two other teams to collapse. Joining the Rangers in the relegation zone at the moment are the Dodgers at 4-6, all against the Giants. Next week's series with Washington visiting Dodger Stadium looms large at the top and the bottom of the First Division standings. The Second Division is mostly the way we last found it, with the New York Yankees and Arizona Diamondbacks holding the promotional positions. The relegation zone is crowded, with the Milwaukee Brewers, New York Mets, Pittsburgh Pirates and Kansas City Royals all within one-half game of each other. The Pirates and Mets meet this weekend in a key series. Likewise, the Third Division looks about the same. The Houston Astros have all but written their ticket for promotion. The Chicago Cubs and the Chicago White Sox are scheduled lightly in this division, 23 games for each club, so making the 10-win threshold with a good enough percentage for promotion will challenge each club. The interesting club here is the Angels, who still are a .500 team across their big league schedule despite numerous injuries. Mike Trout went on the disabled list on May 31 for a thumb surgery. The good news for the Angels is that they have only six Third Division games in June and July, but 26 such games from Aug. 1 through the end of the season. Trout should be back by Aug. 1. The Angels also hope for the returns of pitchers Garrett Richards and Tyler Skaggs by then. If the Angels can get a healthy club working for the last two months of the season, they're looking at an excellent chance for promotion back to the Second Division. The Minnesota Twins took over first place in the Fourth Division last week by going into Baltimore and sweeping three games from the Baltimore Orioles. The Twins beat Baltimore every which way. First, on May 22, the Twins thumped Baltimore, 14-7, with homers by Miguel Sano and Max Kepler. The next day, Ervin Santana pitched a complete-game shutout for a 2-0 win. On the third day, the Twins took a 4-0 lead early and held on for a 4-3 victory. The sweep doesn't finish Baltimore off, by any means, but it's merely another episode in their snake-bitten stay in the Fourth Division, to which they were banished for their fold in the 2014 American League championship series. The Orioles began this history in the Fourth Division in 2010 and, despite their success under the field management of Buck Showalter, they have never been promoted past the Third Division.